Taylor Shellfish Farms provided delicious food, featuring recipes by local resident Xinh Dwelley. GNA hosts greeted event attendees. A huge “thank you!” to all who attended this year’s community picnic, hosted by the Griffin Neighborhood Association. A special appreciation is extended to the sponsors who donated supplies, the volunteers who donated their time, and the many local businesses and organizations who participated. This year’s picnic featured seafood prepared by Taylor Shellfish Farms and hamburgers and hotdogs prepared by volunteers and members of our Board. Drinks and chips were donated by the Steamboat Trading Post. The Island Market and Steamboat Trading Post provided the ice. Over at the driving range, the Salish Cliffs Golf Club hosted a game with prizes and there were kids’ games and face painting provided by the Steamboat Island Church. More than a dozen local businesses and organizations attended. The Tin Cup Golf Driving Range and Steamboat Tennis & Athletic Club donated their facilities for the event. Thurston County Explorer Search & Rescue directed traffic, particularly into and out of the parking area. Wash facilities were provided by Island Johnny. Click here for a complete list of this year’s sponsors, with links to their websites. The booths of local businesses and organizations arranged under sunny skies. Musical guests were Humor & Heart and dulcimer musician Ellen Rice. Each year we strive to provide a picnic event our community wants. In order to do that, we need your feedback! If you attended the picnic, let us know what you enjoyed or didn’t, and what you would like to see added or changed for next year. If you weren’t able to attend, what would it take to get you there, next year? Big bubbles, face painting, and kids’ games were provided by the Steamboat Island Church. One of the biggest hurdles to the organizing committee is finding volunteers to help the day of the event. If you are interested in joining the fun, please contact us at info@griffinneighbors.org. Again, we thank our sponsors, local businesses and organizations, picnic volunteers, and our Board. But most of all, we thank you, our neighbors, for a successful community picnic. 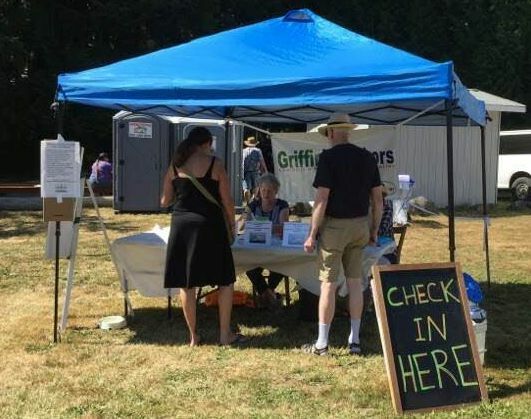 The Griffin Neighborhood Association is entirely volunteer-run. 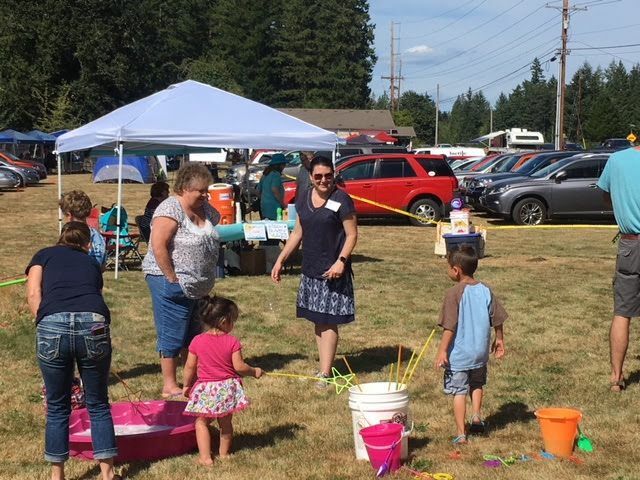 Each year we host a number of events including this picnic, an annual meeting featuring a topic of interest to local residents, and various town halls. The mission of the Griffin Neighborhood Association is to help build community consensus on major issues confronting the Griffin area, including growth, land issues, habitat, water quality, transportation and school planning. The Griffin Neighborhood Association also undertakes and supports projects that benefit our community, help to build a sense of community, and educate the community on topics of interest. Posted in Griffin Neighborhood Association, picnic.